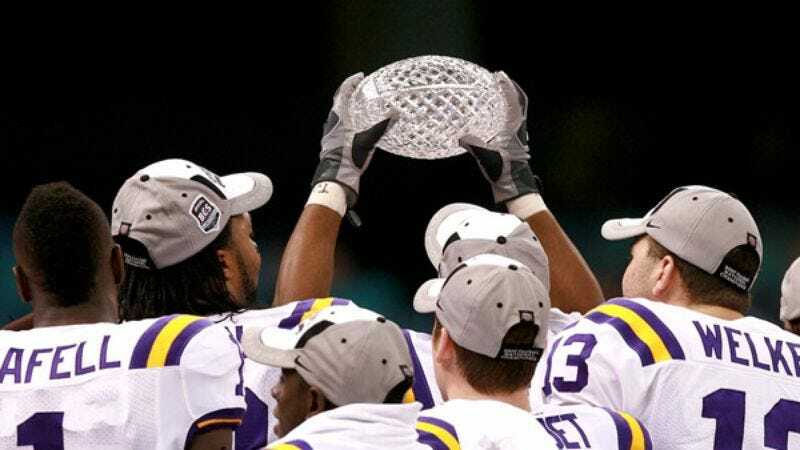 NEW ORLEANS—Mere moments after hoisting the crystal national championship trophy, Tigers coach Les Miles announced that LSU had made the decision to "go out on top" and retire after almost 150 years as a public university. "Believe me, beating the Ohio State Buckeyes was tough, but coming to this decision was much tougher," said Miles, who said he reached the decision after a Christmas day meeting with LSU chancellor John O'Keefe, university president John Lombardi, and Tigers quarterback Matt Flynn. "But I really feel that after winning our second national chamionship in five years, Louisiana State University and Agricultural and Mechanical College has nothing left to prove—to others or to ourselves." "There's not a doubt in my mind that this university will be as successful at whatever it chooses to do in its private life as it was playing football," Miles added. "The lessons LSU learned in becoming national champions will go with us for the rest of our lives, no matter where life takes us." Though established in 1859, Louisiana State University did not play football for more than 30 years, finally giving the game a try in 1893. Even then, success was long in coming, and the school did not win a national championship until 1958. "We don't have the advantages of a lot of other institutions of higher learning, but I'd put our love for football up there with any of them," Chancellor O'Keefe said Tuesday. "But I believe every college, university, what have you, has to be honest with itself and realize there's a time to bow out gracefully. And LSU's time is now." "I'm overjoyed about the championship, and I've enjoyed being a part of what makes this university so great," said Flynn, who was 19 of 26 for 174 yards and four touchdowns in what turned out to be his school's final public appearance. "That's what makes this decision so bittersweet, for me and for all the other players, coaches, students, professors, advisers, administrators, everybody. But when you're done, you're done." Flynn, like most of LSU's 34.000 students, intends to spend a week or so enjoying the victory and celebrating the championship before moving out of his soon-to-be-demolished dormitory and pursuing work in the private sector. "There were so many good times and so much great football with so many wonderful people that I have no regrets," said LSU architecture professor Marsha Cuddeback. "Sure, I'll miss teaching here. But there's not a doubt in my mind this is the right thing to do." "You get to a point where there's just nothing else to accomplish," President Lombardi told reporters Tuesday, in between completing the paperwork that would cancel the spring semester and arranging for the sale of LSU's 2,100-acre campus. "From here on out, we at the university would just be padding our career stats. That's not how we want to be remembered." "When people think of LSU, we want them to think of a class act," Lombardi said. "We want them to say, 'There's a school that really knew when it was time to walk away.'"